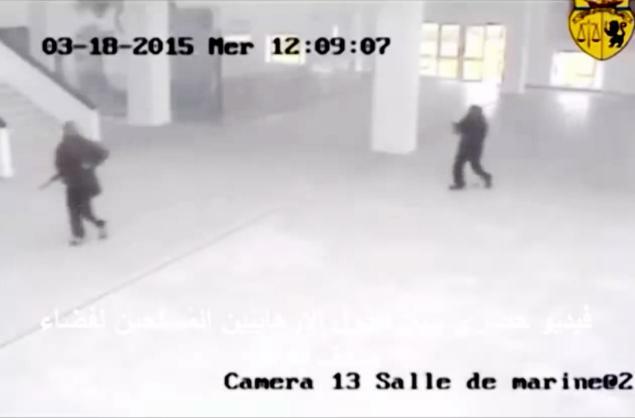 A video released by the Tunisian government shows gunmen walking through the Bardo museum during the attack that killed 25 people on March 18. At one point the security camera footage, released by the interior ministry, shows the two attackers bumping into another man who is allowed to flee after the brief encounter. Authorities said they had arrested more suspects in connection with the attack in the capital, Tunis. The gunmen are said to have been trained in Libya in an area controlled by Islamic State (ISIS) militants. ISIS has said it was behind the attack on the Bardo museum, which is next to Tunisia’s parliament. The men, named as Yassine Laabidi and Hatem Khachnaoui, were killed in a gunfight with security forces inside the building. At least one of them was wearing an explosives belt. Twenty foreigners were among those killed, including British, Japanese, French, Italian and Colombian tourists. The footage shows the men carrying assault rifles and bags as they walk through the museum. It also captures the moment a startled visitor comes face to face with them. The gunmen briefly point their guns at the man but allow him to run away as they make their way up a staircase. Earlier, a spokeswoman for the prosecutor said substantial progress had been made in the investigation – but she did not give any details. Authorities have arrested more than 20 suspects since the attack, including 10 people believed to have been directly involved. “There is a large-scale campaign against the extremists,” interior ministry spokesman Mohamed Ali Aroui told reporters. Tunisia has seen an upsurge in Islamist extremism since the 2011 revolution that ousted dictator Zine al-Abidine Ben Ali and sparked the Arab Spring. The leader of Tunisia’s moderate Islamist party, Ennadha, says the country will continue to be under threat of attack as long as neighboring Libya remains unstable.